The moon has lost its radiant magic staff. Paul wants to bring it back, with the help of the sparkle sprites. Players roll the dice and move Paul forwards accordingly. 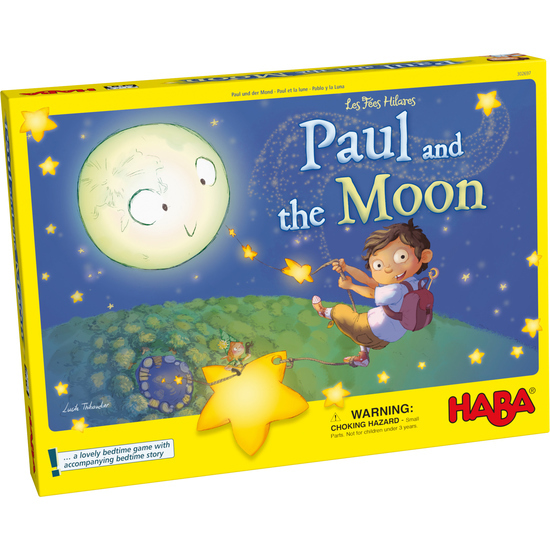 They search for the symbol that Paul lands on under the face-down star tiles. If they find the right symbol, they hang the matching sparkle sprite on the next star of the star path; otherwise the cloud is pulled further over the moon. If every star has a sparkle sprite hanging on it before the moon is completely covered, then the players all win together. Contents: 1 Paul’s garden (star path and garden pond), 1 play figure Paul, 5 star tiles, 30 sparkle sprites, 1 die with dots, 10 wooden stars, 1 set of instructions with bedtime story.